Technology and Digital Question papers offer many candidates a practical, independent method to access SQA examinations, but writing expressions in maths and science can be a challenge. We have some advice on the CALL Digital Assessment web site and recently I've been doing a little more work on the topic. The SQA National 5, Higher and Advanced Higher maths papers and answer booklets are PDF files with answer boxes (form fields) that do allow candidates to use bold and italics, and sub and superscripts. but they really aren't up to the job for most of the questions in the maths exams. For example, it's very hard to write fractions or vectors. So instead, I think a better approach is to use an equation editor that is designed for the task. Of the equation editors available for Windows computers, I like FX Equation from Efofex the best, because it's written for secondary school mathematics; it's quick and easy; and most if not all of the equations can be typed using the keyboard, which means that students who have difficulty with mouse or pointing devices can use it. Lastly, the wonderful people at Efofex offer FREE licences for students with disabilities through their EmPower Foundation. 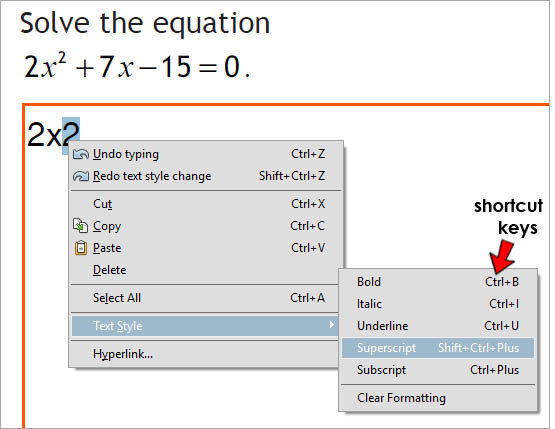 Now FX Equation (and most other equation editors) doesn't work very well in the PDF form fields, so how about we use a Word file instead, since FX integrates well in Word? 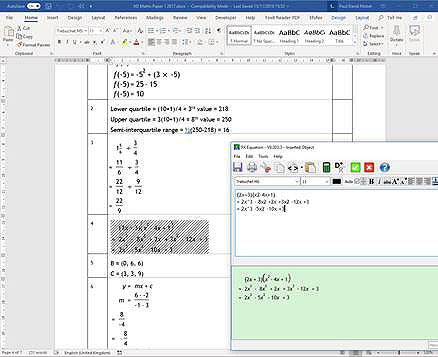 With that in mind, I've created Digital Answer Booklets in Word format for the two National 5 maths papers. Both are based on the SQA Generic Answer Booklet, and I've added formulae that have been created in FX Equation, so that candidates can copy and paste a formula for use in a question. I'm thinking that many candidates would read the questions from the paper copy, and then use FX to type their answers. Candidates could also read the question on computer with the Digital Question paper, but the screen would get pretty cluttered. To give an idea of how it works, I've gone through a 2017 Maths paper and used FX Equation to answer most of the questions. 2017 National 5 Maths Paper 1. National 5 Paper 1 Digital Answer Booklet FX Equation. National 5 Paper 2 Digital Answer Booklet FX Equation. I don't know how well this will work in practice, so I'm very keen for people to test these out and feed back comments or suggestions for improvement to Paul.Nisbet@ed.ac.uk. You do of course need to know how to use FX Equation, and you can find out more from the sources below and from the Efofex web site. FX Equation - The Race. Introduction to FX Equation (PDF file).